The strong record of Socialist Alternative Seattle City Councilmember Kshama Sawant in achieving victories by organizing and activating working people is the basis to win more, especially for affordable housing. After winning legislation for a $15 an hour minimum wage, the task to make Seattle affordable for all is far from done. Donate and volunteer in this year´s referendum on the first open socialist elected in the city in a century. This campaign promises to be the most highly visible city council race Seattle has seen in decades, one that pits the corporate establishment against the only consistent voice for working people on the council. Moreover, the impact of this campaign will extend far outside of Seattle, with the potential to inspire more independent, left-wing, pro-worker challengers to the two parties of big business nationwide. 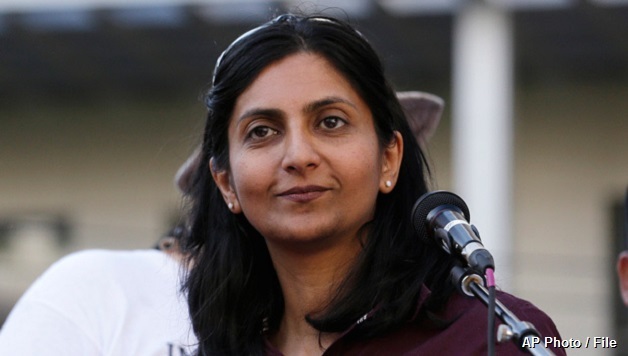 Kshama Sawant´s election victory in 2013 showed that you can challenge pro-corporate candidates independently of the Democratic Party, without taking any money from the super-rich and big business, and on a platform that benefits working people. In 2015, we’re going to prove you can do all that, win concrete victories for working people at the expense of corporate interests while in office, and win re-election. Kshama is running on a strong record: Through the combined efforts of low-wage workers, the labor movement, 15 Now, and Kshama’s role as a councilmember, we passed a $15 an hour minimum wage – the first major U.S. city to do so. Through the efforts of Kshama Sawant’s council office, we passed Indigenous People’s Day, won millions in funding for social services through the People’s Budget, won raises for low-wage city workers, and won a major victory in helping defeat a brutal attack on low income housing: the so-called “Stepping Forward” program. We showed that when we organize, we can win! You´ll find many more reports of small and big efforts of Kshama and Socialist Alternative on our website, SocialistAlternative.org or Kshama´s council blog, Sawant.Seattle.gov. Now, with the call to “Make Seattle Affordable for All,” the campaign to re-elect Kshama Sawant to Seattle City Council in 2015 is off and running. In recent polls, Kshama Sawant had a 61% approval rating in her district, and she has become the third most popular representative in the city. However, the corporate establishment, enflamed at the passage of the $15 an hour minimum wage and determined to head off any other reforms that would threaten their profits, is intent on unseating her. Already, two candidates to the right of Kshama Sawant have entered the race, Rod Hearne and Morgan Beach. In reality, this election is a referendum on Kshama and the pro-working-class interests she unapologetically fights for. Why will the establishment find us so hard to beat? Because of the grassroots campaign we will launch, and because of your donation and the energy that you can give to support this campaign!